Boaz manages the company’s goals, stewards the company’s mission, and creates opportunities for Bocoup’s engineering staff to make positive changes to the web platform. Boaz is a member of the ethics working group at the Berkman Klein Center for Internet and Society, where he is working on publishing a critique of the values embedded in “open source” production. Between 2016 and 2017, Boaz ran a contemporary art gallery with a focus on tech criticism. During this time he curated works from artists exploring the role and impact of technology on society. 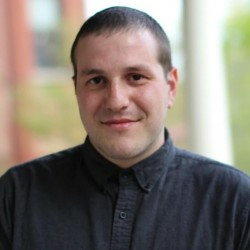 Boaz has spent the last nine years at Bocoup helping Bocoup’s customers adopt open source technologies and workflows. Prior to Bocoup, Boaz worked as a front-end developer for a dot-com where he built early client side web applications. Boaz studied Liberal Arts at Bennington College from 2003 to 2005. His software production education came from shadowing the jQuery team to write the jQuery API documentation, and then working as a consultant alongside really brilliant programmers and designers for the last 12 years.